On November 14, the Mary Leonard Law Society hosted a sold out luncheon in honor of the 2012 admittees to the Oregon Bar. The luncheon, which was held at Gamboretti’s Italian Ristorante in Salem, featured a keynote address by Attorney General Ellen Rosenblum. In speaking to the many new admittees, justices, judges, and local practitioners in attendance, Rosenblum drew on her own professional experiences to highlight that you can never know at the outset where your career will lead, and to encourage new admittees to not shy away from new and unexpected challenges. The Mary Leonard Law Society New Admittee Luncheon is held each fall to both honor and provide a warm welcome to our new colleagues. 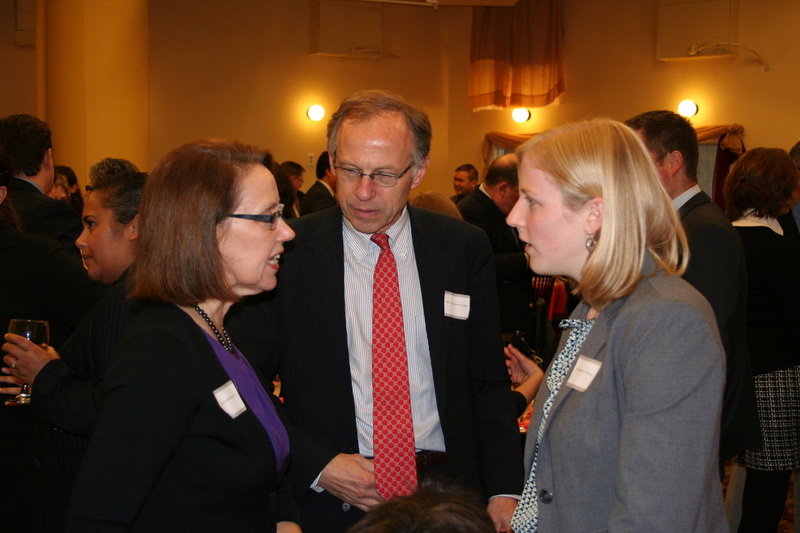 Attorney General Ellen Rosenblum and Oregon Supreme Court Chief Justice Balmer speak with new admittee Katherine Thomas at the 2012 Mary Leonard Law Society New Admittee Luncheon.